Last Wednesday I had the incredible opportunity to meet Chef Lynn Crawford! You probably recognize her from Food Network's Chopped Canada or Pitchin In. Last week, Chef Lynn Crawford was out in Western Canada cooking and demoing Catelli's newest line of pastas - Healthy Harvest Ancient Grains. 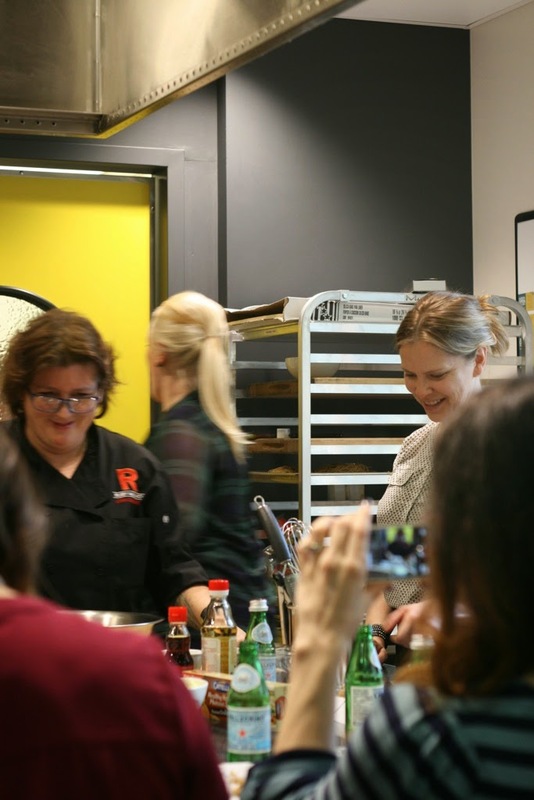 It was a great night enjoyed by all in Get Cooking's space filled with tasty pasta ideas from Chef Lynn Crawford, canapés from the Get Cooking team, and demos of Catelli's Ancient Grain Pasta from Chef Lynn Crawford. 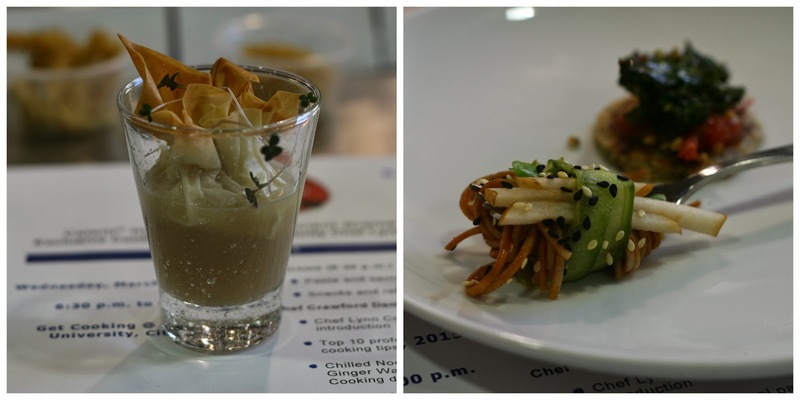 We also had the opportunity to put together a dish using Catelli's pasta ourselves! Phyllo pastry with crunchy pear and pear soup (left from Evert), buckwheat noodle with yellow asian pear and a cumin coconut pancake (right from Alexei of S'wich Food Truck). The pasta is made with 100% whole grain Canadian wheat and five ancient grains: quinoa, amaranth, millet, sorghum and teff. We also learned how cooking times could affect the firmness of the pasta. 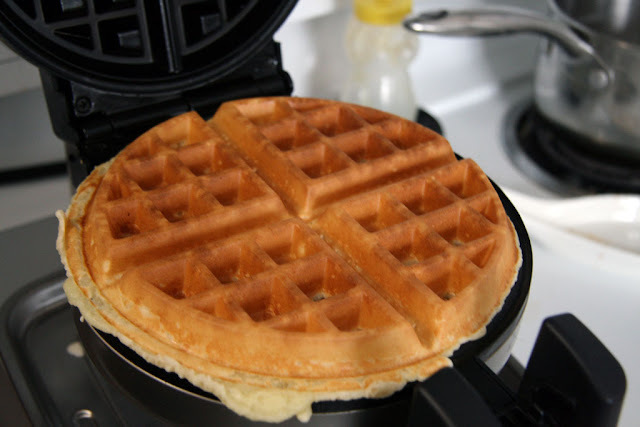 However, the firmness depends on preferences as well so there can be a lot of variety in cooking times. One of the exciting parts of the evening was watching Chef Lynn Crawford demonstrate a simple but delicious dish of pesto-dressed spaghettini and marinara rotini with fresh shavings of cheese on top. Then all of us food bloggers and the media (after taking photos) cleaned our plates! After all the demos, we divided into groups to make our own Chilled Noodle Salad with Ginger Wasabi Dressing to take home and of course photograph. Of course, I had a slight celebrity chef fan-girl moment when I wanted to get a picture with Chef Lynn Crawford. The bonus was when I shared with her that she could use a timer for selfies, she even instagramed our photo! Alright! 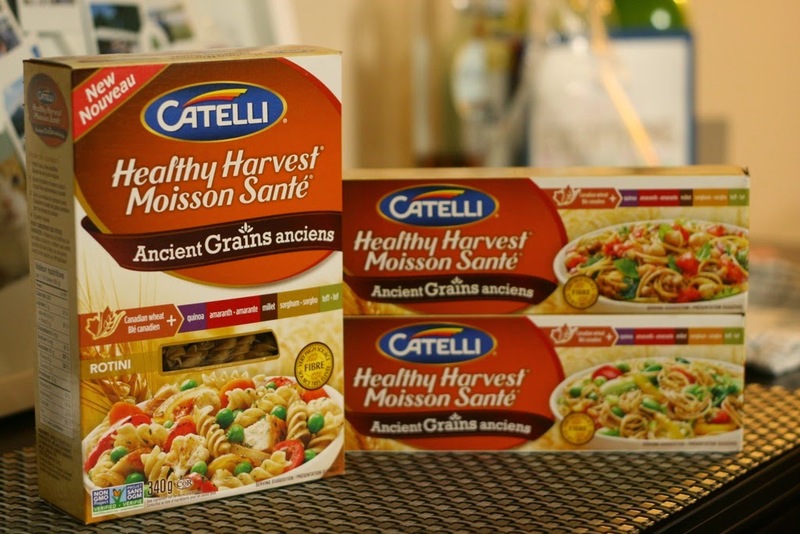 So I am excited to share that one lucky Canadian reader or follower can win a year's supply of Catelli®'s Healthy Harvest Ancient Grains pasta through this blog! Catelli® will ship the year supply of pasta to you. This giveaway is open only to residents of Canada. Enter the giveaway in the Rafflecopter below with your details. Make sure you leave a comment as that is the mandatory requirement for entering the giveaway. Good luck! 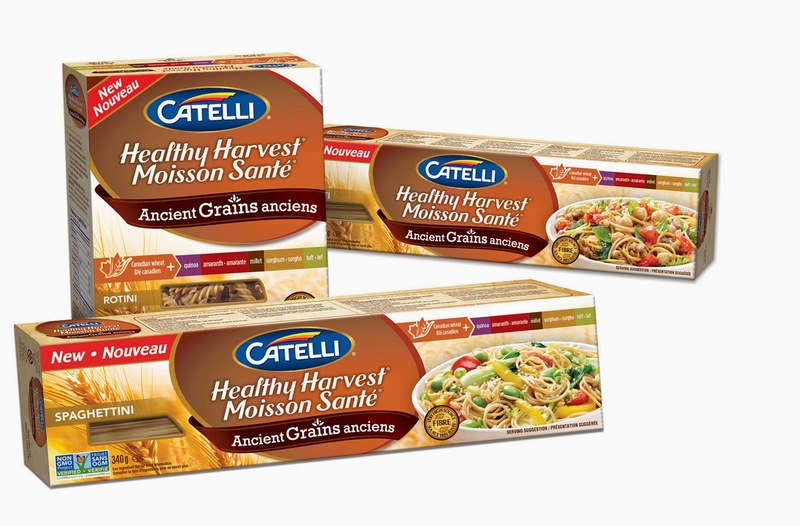 Prize: One (1) lucky reader or follower will win a year supply of Catelli® Healthy Harvest Ancient Grains Pasta (60 boxes, valued at approximately $200). Duration: Giveaway closes on Wednesday April 8, 2015.
Who Can Enter: Open to residents of Canada. Mandatory Entry: Leave a comment on this post about what dish you will make with this pasta and with which type of pasta (Spaghetti, Saghettini or Rotini). Need some inspiration? 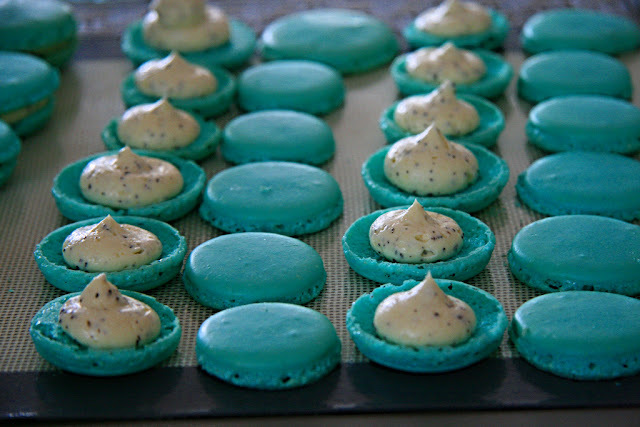 Visit Catelli's recipes. How to Enter: Please follow the instructions in the Rafflecopter below. Remember that leaving a comment is mandatory. Additional entries included in the Rafflecopter. How will the winner be chosen: The winner will be chosen at random and will be notified via email. The winner will have 24 hours to respond or a new winner will be chosen. 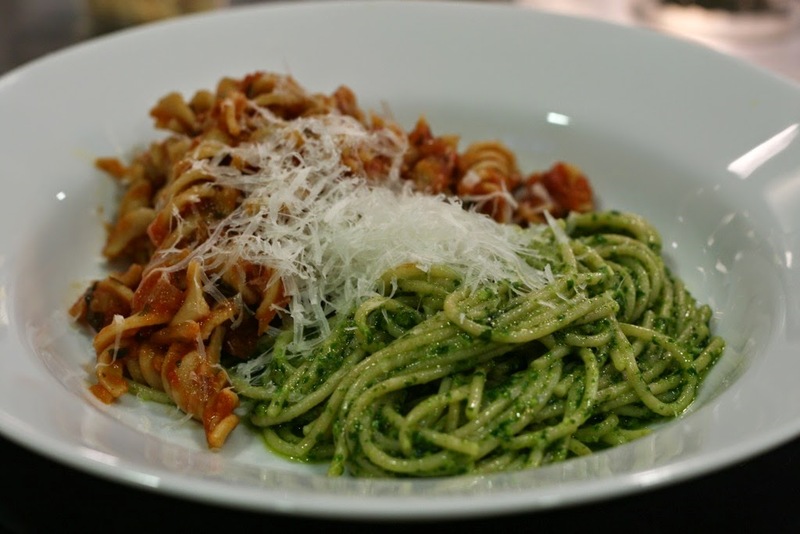 With the Rotini pasta, I would make a roasted walnut spinach pesto sauce! Mmmm! Thank you for the chance! Yum spaghetti with homemade pasta sauce! Rotini Pasta salad with tuna, tomatoes, cucumber, avocado, fresh parsley, dressed with cucumber dill dressing. I would like to make a creamy garlic bacon dish with rotini. i love love love spaghetti and meatballs! i would use the spagettini! 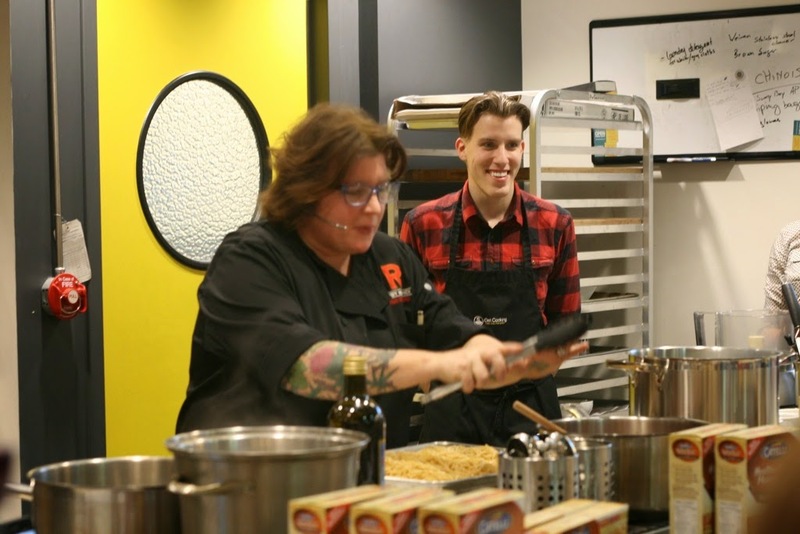 great opportunity to meet and cook with chef lynn! I would make the rotini with three peas and pesto! Yum. Spaghetti With Feta and Broccoli is a favourite. I like to make rotini with a rose sauce and finely diced veggies. I would make spaghetti with meat sauce and mushrooms,peppers,and onions! I would make spaghetti with alfredo and broccoli ! Linguine or spaghetti with avocado pesto! I would make rotini with meatsauce and meatballs. I would make rotini with tomato sauce, mushrooms and mild Italian sausage. I would make a nice Parmesan pesto! Would love to make Fettucini alfredo, even though it's so rich. I would love to make chicken carbonara with the spaghetti. 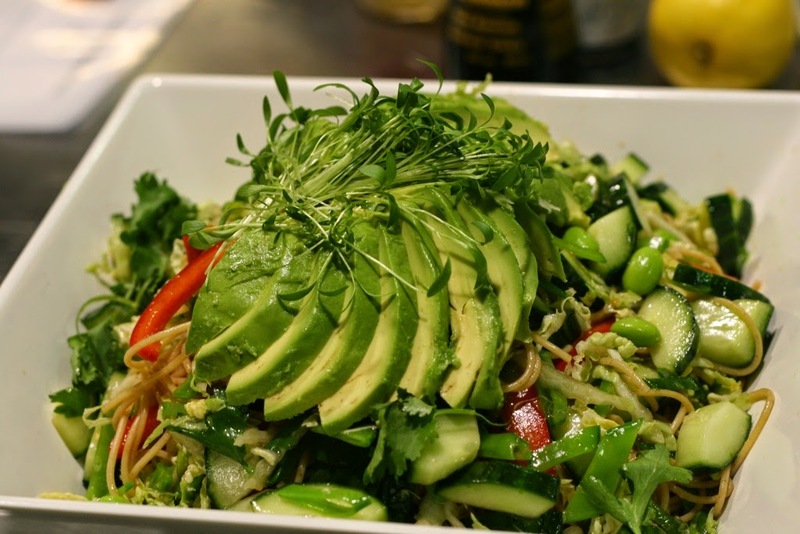 I would start with a pasta primavera with lots of veggies using Spaghettini noodles. Spaghettini with alfredo sauce, shrimp and spinach...getting hungry just thinking about it! I would like to make Spaghettini with tomatoes, tomatoes sauce, basil and sausage. Spaghettini with shrimp and cherry tomatoes. Fettucine Alfredo with crab is my favorite! I am going to make Spaghetti with Turkey Sausage and Kale. Healthy and delicious!! I'd like to make Spaghetti with turkey meatballs! I would like to make the Sesame Salmon Spaghetti Toss. I would love to make Spaghettini with shrimp and scallops! I would like to make spaghetti and meatballs with homemade sauce. One dish I'd like to make with this is spaghetti in avocado sauce. I'd make a Rotini with pesto and extra cheese. Mmmmm....makes my tummy hungry! I would like spaghetti and meatballs with the spaghetti.